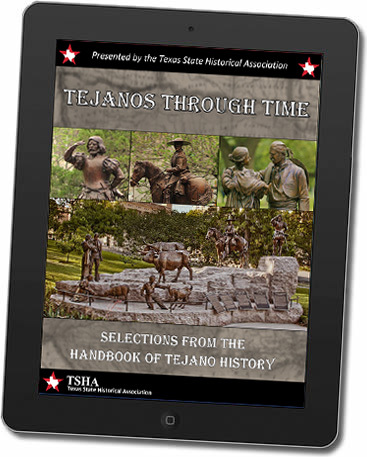 The Texas State Historical Association, the oldest and most important professional organization dedicated to preserving and advancing knowledge about Texas history, recently announced the publication of an eBook entitled Tejanos through Time, Selections from the Handbook of Tejano History. The publication, edited by Emilio Zamora, Professor in the Department of History at the University of Texas at Austin, and Andrés Tijerina, Professor in the Department of History at Austin Community College, brings focused attention to the fastest growing population group in Texas that has also played a significant role in the history of the state. Aside from acknowledging the contemporary and historical significance of Tejanos, the Association is announcing its commitment to a full rendering of Texas history in its online Handbook of Texas History. Tejanos through Time began as a one-year project to increase the number of articles on Tejanos in the Handbook of Texas. The Handbook of Tejano History project received financial support from the Tejano Monument Inc., the organization responsible for the magnificent Tejano Monument on the Southeast section of the Texas Capitol Grounds. The project was so successful that the authors who answered the call for generating new articles on Tejanos for the Handbook of Texas exceeded the original goal of one hundred works to produce two hundred pieces that will be appearing in the Handbook of Texas. A new and more extensive eBook and hard copy version on Tejano history will be available in March 2017. Not Even Past takes this opportunity to once again welcome the Association back to the University of Texas. Our History Department was instrumental in establishing the organization in 1897. It operated here until 2008 when it moved to the University of North Texas. Last year, the organization relocated its offices back to the University of Texas at Austin where it has re-established its relationship with the Department of History. The publication of Tejanos through Time is a welcomed cause for celebrating this renewed relationship. If you wish a complimentary copy of Tejanos through Time, please access the following site: www.tshaonline.org/membership/tejano.